This underground college film festival celebrates cinematic innovation through its screenings of experimental and classic arthouse film. Mixing wit with experimentation, our posters have shaped the festival’s distinct personality for over fifteen years. The 2004 Johns Hopkins Film Festival poster transforms into a 32-page flipbook when torn apart along the poster’s perforated grid. In flipbook form, the poster/animation can also be used as “directions” for getting to the festival as it zooms into the United States, Baltimore, a map of the campus, and finally into the building and theater where the films are screened. When deconstructed, the poster transforms into an example of time-based media that the festival showcases. 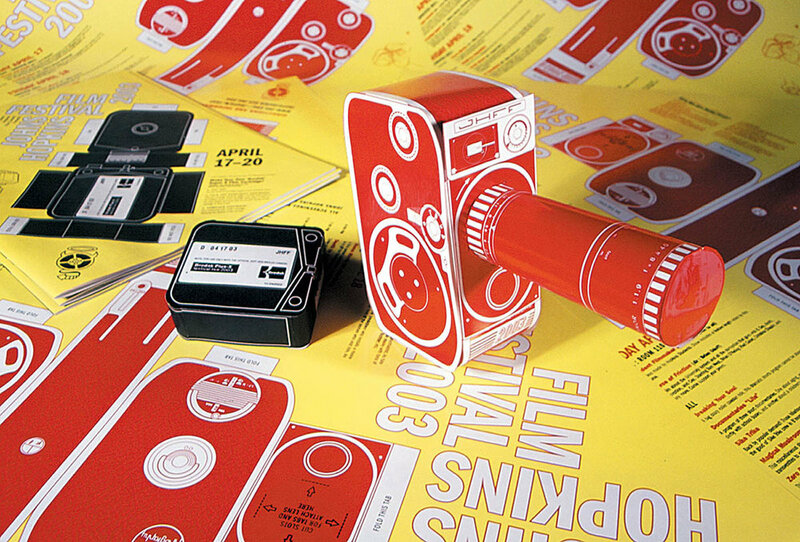 The 2003 poster and program cover double as scale models of a film camera and Super 8 cartridge. With a little bit of tape and patience, cinephiles can transform the festival promotional materials into their own model camera and film (not light-safe). 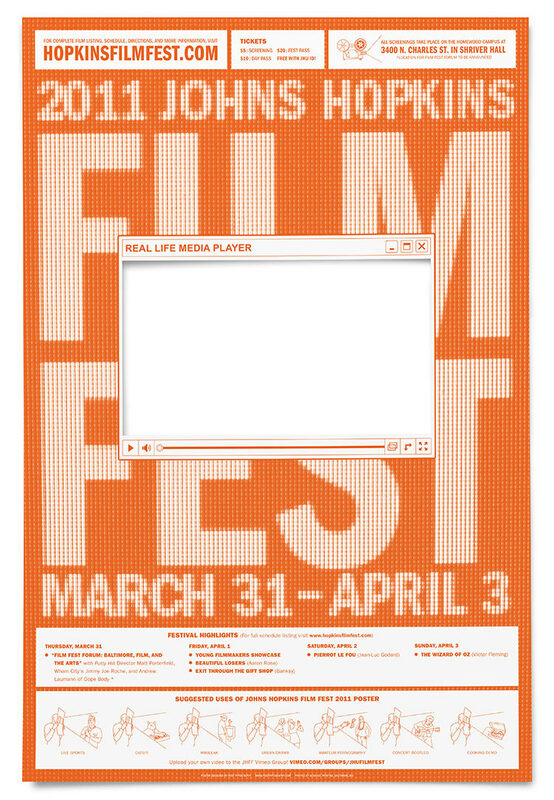 This poster doubles as a “Real Life Media Player,” incorporating a die-cut window in the poster’s center that allows viewers to experience mundane moments as if they are watching an entertaining YouTube video. In tribute to the still-vital medium of analog film, the 2012 Johns Hopkins Film Fest programming focused solely on screening 35mm and 16mm prints. 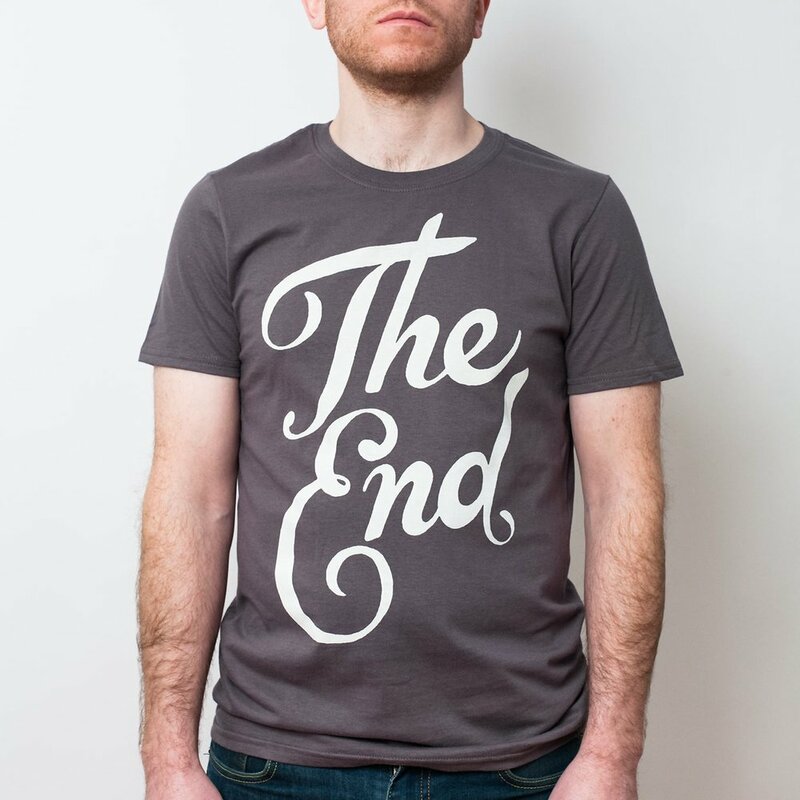 For the poster we hand-lettered a giant “The End” in the style of classic movie titles and crossed it out with custom-printed translucent tape with the festival information. The 2010 Johns Hopkins Film Festival poster takes the form of a screenplay... of someone looking at the poster. Meta! The text was typed on an old typewriter and blown up to massive scale on this 36” tall print. 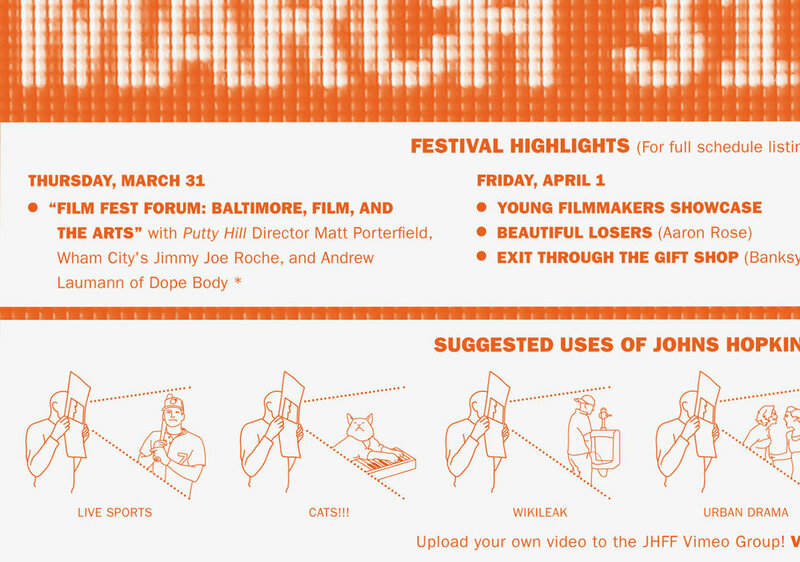 Our JHFF posters have graced the street poles of Baltimore and the pages Print and Communication Arts (among others). Each of these oversized posters was hung with a set of 3D glasses attached for cinematic views of this King-Kong-sized Baltimore rat. This poster breaths new life into an obsolete VHS tape and references underground film’s constant experimentation with new and old media. The poster for the 2008 festival references a different side of the film industry—seedy x-rated cinema—and resembles a page torn from the back of a 1970s-era dirty magazine. Our 2009 Film Fest poster plays on the “College” aspect of this university film festival. Starting with that mainstay of college keg parties, the red Solo cup, we built a working “broetrope” that is shown on the poster at monumental scale. Film festivals typically overwhelm with too many choices. Luckily our handy poster/flowchart is here to help. The 2014 Johns Hopkins Film Festival took place over Valentines Day weekend. Inspired by corny Valentines from our elementary school days, we created a grid of 14 hand-drawn cards filled with puns and film references. The perforated poster also allows viewers to tear off the cards and give them to their friends or sweethearts. 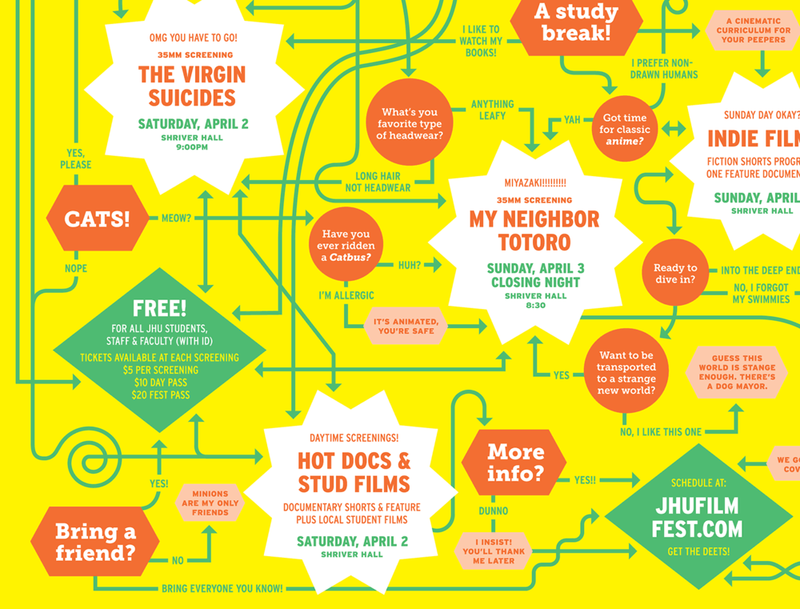 Our poster design for the 2013 Johns Hopkins Film Festival invokes and mocks the excesses of movie theater concession stands with a full range of tiny to extra-jumbo sodas, popcorn boxes, and candy—all hand-drawn in a lively spring color palette. The Festival’s theme for 2017 was “Coming of Age.” We stubbed out a cigarette candle on this a pastel cake slice to capture the dark, angsty tones of this year’s films.